Finding a dog that is an optimal match for your household and lifestyle is a key to maximizing the joy of your pet-owning experience. 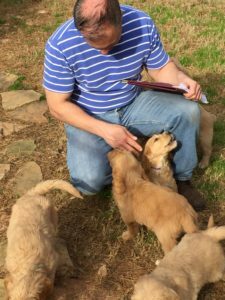 Fortunately, CPT has terrific dog and litter evaluation services that boost the probability that the dog or puppy you select will be the ideal dog for you and your family. 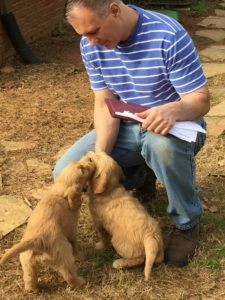 For more information on CPT’s dog and puppy selection processes, please read the articles entitled “Selecting the Right Dog” contained within the CPT website. 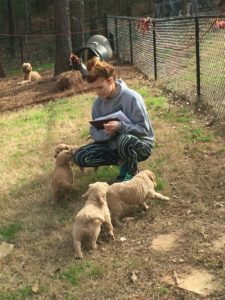 To schedule a CPT Dog or Litter Evaluation, please contact CPT by email or contact the CPT office by phone at 404-236-2150. 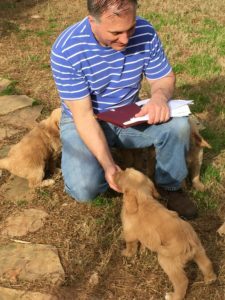 The photos below show CPT’s Mark Spivak evaluating puppies at the site of breeders Cori and Laurie Trochek of Abounding Grace Doodles. The puppy selected on the photographed day is currently undergoing its first-stage training in CPT’s Service Dog Program. 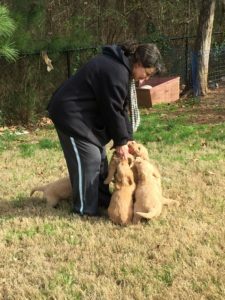 Yet, CPT’s selection services are not just for prospective service dogs. 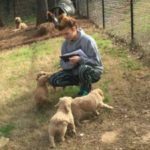 Dog and litter evaluations are for pet households, too! 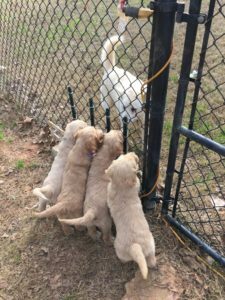 The puppies interact confidently with an older dog, which is a very good sign. Evaluating the litter in group after completing the one-on-one portion of the evaluation. The score sheet is always at hand! Evaluating the puppy’s confidence and desire for human social interaction.